If you are signed in to Inbox.com Webmail, sign out by clicking on the Logout button hidden under account name dropdown at the top of your screen. 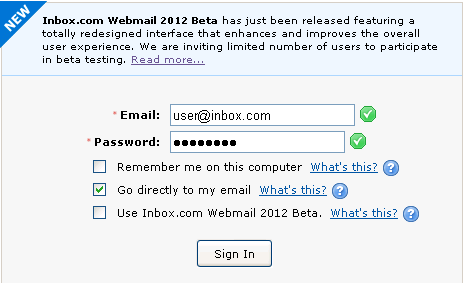 Select the option “Use Inbox.com Webmail 2012 Beta” by checking the box and then click on the Sign In button. Although the Mail module has been revamped to the new version, other modules including Contacts, Organizer, Notes, Storage, Photos and Settings are yet to be updated. That’s why when you click any of these you are directed to the older version of the user interface. To get back to the new interface, click on the Email tab at the top left corner of the older interface. How can I return to the previous Inbox.com Webmail version? 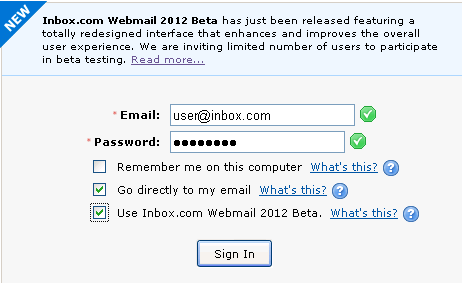 Uncheck the option “Use Inbox.com Webmail 2013 Beta” and then click on the Sign In button.